An extended rear facing child car seat, is a seat which allows a child to travel rear facing for longer, usually up to 4 years of age. These seats have been used in Sweden since the 1960's, and over the past few years, they have become increasingly popular in the UK due to their excellent safety offering. ISOFIX, or seat belt fitted? 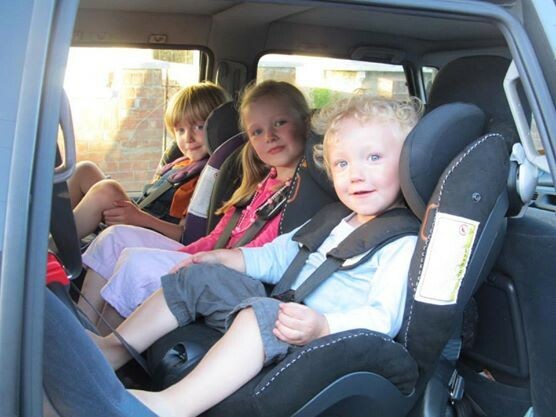 Extended rear facing car seats are available with ISOFIX, and there are also seat belt options available. ISOFIX extended rear facing car seats have an 18kg weight limit (i-Size seats may differ), and some belt fitted rear facing seats have an 18kg weight limit. There are also many seat belt fitted seats which have a 25kg weight limit. Combination, or rear facing only? Some extended rear facing seats will allow the option of putting your child rear or forward facing, where others can only be fitted rear facing. Extended rear facing car seats are currently tested to R44.04. Many iSize child car seats which are approved to R129 will offer longer rear facing, up to approximately 4 years old (105cm). Some rear facing only car seats may also have passed the Swedish Plus Test. One of the most common questions asked about keeping children rear facing is "Where will their legs go?" While children are very flexible and comfortable in a rear facing seat, it can look quite odd to adults. There are seats available which have extended leg room options, which is usually achieved by adjusting where the seat is fitted on the vehicle seat. If children feel the need to stretch out their legs, they can stretch them up the back of the vehicle seat. What is the best extended rear facing seat to buy? Method of fitment – There is no safety difference between a properly fitted belted seat, and ISOFIX seat, however ISOFIX is considered safer as it reduces the risk of incorrect fitment. Belt fitted extended rear facing seats can be more difficult to fit. With any method of fitment you choose, be sure to seek professional advice and fitting help, read the manual and practice fitting the seat so you are confident with it. Combination or rear facing only – Do you want to have the option of using the seat forward facing 'just in case', or are you 100% sure that your little one will be rear facing up until the limit of the seat? Take this into account when choosing your seat, if you aren't completely sure you will be rear facing until 4, you may want to opt for a combination seat. Similarly, if you know you definitely will be rear facing to the limit, you may want to consider a rear facing only seat, as these can often be cheaper! Additional fitment – Almost all extended rear facing car seats are classed as semi-universal, and they will have a vehicle compatibility list available online. Before you buy your seat, check that every car the seat will be used in is on the compatibility list. Is your child tall or heavy for their age? – Child seats with an 18kg limit will accommodate most children to around age 4. If your child is likely to reach 18kg long before their 4th birthday, a seat with a 25kg harness limit will give you better longevity. You may also want to consider a 25kg harness limit seat if you wish to rear face beyond 4 years of age. Where to buy – extended rear facing car seats are becoming increasingly available in major retail stores. However, you are more likely to find them in your local independent nursery retail shop. Phone up local stores to see what they have in stock, and if they are trained to show you how to safely fit the seat. Are you a new parent or parent to be? We've got together all the information new parents need to know when choosing and using their first baby car seat. Whether you’re a first time expectant parent, or have children already, it’s well worth a read! The law requires all children under the age of 12 years old or 135cm/4’5’’ to travel in a suitable child restraint. For kids under 3, there is only one exception to this rule, and that is in taxis. Babies and children under 3 may travel unrestrained in the back of a taxi – at any other time, they must use a suitable restraint. Of course that doesn’t make holding your baby in the back of a cab safe! Every effort should always be made to use a child seat, the exception is there for convenience only. The law requires you to use a suitable child car seat, so what options do you have? There are currently two regulations running along side each other, and they will do for some years to come. Regulation 44 has been around for many years, and R44.04 is the latest amendment to that regulation. There has been several amendments to R44 - R44.01 and R44.02 are no longer allowed to be used. An R44.03 seat may be used, but it is very likely the seat will be old. R44.04 testing focuses on ease of use, fitting, stress testing on components and the crash test is a frontal impact (32mph), rear impact (18mph) and a roll over test. To select the appropriate stage R44 seat for your child, you must go by their weight first, then their height. There are not many i-Size child car seats currently available from newborn, however they are becoming more readily available. Some i-Size car seats have a base, which the infant seat can attach to and when the baby is outgrowing the infant seat, you can then buy the i-Size seat to fit to the base. An i-Size child seat utilises the ISOFIX in your vehicle, and babies must rear face to 15 months in them by law. i-Size car seats have also gone through mandatory side impact testing and an improved roll over test. They are also chosen based on your child's height and stature, rather than their weight. A newborn wedge and head hugger that is easily removable. Easy adjustment of the harness. Easy seat belt routing or ISOFIX. A good, reclined position when rear facing. Some 0/1 seats are too upright for a newborn. A newborn insert that gives a more natural lying position, head support and torso support. An easily adjusted harness. This will save lots of time and frustration and is a safer option than a re-thread harness, which carries the risk of the harness not being adjusted correctly or re-threaded incorrectly. Not every child car seat fits every car! This is very important to remember with every car seat, no matter what stage you are at, whether you are using ISOFIX or the seat belt - there are many fitting issues that can occur. If you are opting for an ISOFIX 0+1 seat, or just using the seat that comes with the pram, it is essential to ensure the seat not only fits your car, but every car it will be used in. You can find out if your seat fits your car buy visiting a retailer that offers a fitting service to buy your car seat. If you opt for a group 0+ car seat that fits to your pram, it is essential to know that your baby should spend as little time in their car seat as possible when it is used on the pram. Infant seats ‘scrunch’ a newborn over, causing their oxygen saturation levels to drop – this leads to a whole host of potential risks, from increased SIDS risk, flat head syndrome, through to ADHD in later life. It can also effect their spinal development and cause problems in later life. The website www.babybwell.co.uk has lots of links and information where you can read up on the risks of excessive car seat use. Wherever possible, use the lie flat part of your pram, not the car seat! **NOTE: Your baby must ALWAYS use their car seat in the car, even if the journey exceeds 90 minutes. You should never install a rear facing car seat to a seat with an active frontal airbag. Even in low speed crashes the airbag can deploy, smashing into the back of your child’s car seat, giving a very real and high risk of fatal injuries. This will probably be the most nerve wracking drive of your life! The best way to ensure you are as relaxed and focused as can be on that first drive is by making sure you are confident with the safety and protection you are giving your new baby in the car. The first step is to ensure the car seat is compatible with your vehicle, then you need to know how to fit the seat properly – it’s not always as easy as it seems! Practice fitting the car seat as much as you can before you are due to give birth. Make absolutely sure everyone who will be fitting the seat is comfortable with it – even if you have bought an ISOFIX seat. Also check the positioning of the carry handle if you opt for a group 0+ car seat – the handle often needs to be upright or towards baby’s feet to act as a re-bound bar. The next thing to get right is strapping your baby into the seat. Many parents get this bit wrong, as they are often worried the straps are too tight on the little one and unintentionally put them far too loose as a result! The harness needs to be level with or just below your baby’s shoulders and tight enough that you can get two fingers flat between your baby’s chest and the harness strap. It can be tempting to wrap your baby up tight when they first go in their car seat, but it’s very important that all blankets, jackets and snowsuits are removed before your baby is strapped in. To keep them warm, dress them in thin layers, then add a thin blanket once baby is strapped in. This blanket should be no higher than armpit level. Remember – your car will soon heat up, and a heavily swaddled or wrapped up baby will soon be an overheating, unhappy and sweaty baby! We all love cute accessories, and you may want to add some cute toys to your baby’s seat, or interactive toys as they get older. This is fine to do, but ensure the toys are securely attached, and that they do not interfere with the seat, the fitment or use in any way and also make sure they are soft. In a crash, all loose items in the car become projectile – loose toys can become lethal. This is an essential accessory for any Mum, Dad or Grandparent! See me mirrors are ideal for helping to calm those nerves and can keep you focused on driving. They let you glimpse the baby in the rear view mirror so you can drive knowing that your baby is safe and well in their seat. ISOFIX is an international standard of fitting child car seats. In most modern cars, and even some older cars, there are ‘D’ shaped hooks in the base of the back seats on either side (some vehicles may have ISOFIX points in the middle or front seat) to find out if you have ISOFIX, either put your hand in the join between the passenger seat base and the back and run your hand along it until you feel them, or check your manual. ISOFIX is considered safer than a seat belt fitted child seat as the risk of fitting the seat incorrectly is very small. An ISOFIX child seat is also quicker to fit, easier to fit and is attached to the chassis of the vehicle. ISOFIX seats also come with other safety features like an impact leg or a top tether. These devices must be used, if supplied, as they reduce the rotational and forward movement of the child and the seat in an impact.